I was struck this week by two passages from two different men who, through their writings, have helped tutor me on better seeing (and preaching) Jesus as the sum and substance of the Bible. Both statements I think are helpful rebukes for what often passes as preaching in Christian congregations in America. Indeed, I’m sure I’ve preached many a message that would rightfully fall under their wise critique. Nevertheless, I’ve endeavored to grow in reading and preaching the Scriptures in the same fashion as Jesus and his apostles. This has meant as much unlearning as learning. Frankly, I’d argue the apostles, based on their usage of the Old Testament in the New Testament (and their preaching of it), would have flunked both hermeneutics and homiletics classes in many a seminary. I was trained in the grammatical-historical tradition which has dominated evangelicalism. And while I believe it to be a solid part of the foundation for preaching, I’ve also come to trust that without a Christological understanding of the Scripture, messages can run the risk of being something less than Christian. How so? This is where the two passages on preaching give insight. I was taught that a text cannot mean what it never meant. In other words, what is critical in understanding a passage is learning what the original audience understood about what was being written to them? Once again, while I believe this is an important part of hermeneutics, by itself it’s inadequate. Greidanus reminds the modern-day preacher that he stands on grand mountaintop of the New Testament revealed in the life, death, and resurrection of Jesus – an apex from which he has the final and ultimate view of the smaller, preceding Old Testament peaks that have both informed and led him to this final summit. To visit those previous, lower hills must be done so in light of the grand, towering heights from which he now stands. Simply put, when referring to Old Testament passages, the New Covenant preacher knows more than the original Old Covenant audience and not only can but should preach those texts with that difference in mind. This use of progressive revelation most specifically centered in Jesus is what makes the preaching of the Old Testament uniquely Christian. All one needs to do is merely look at the teaching/preaching of Jesus and the apostles to reaffirm this truth Greidanus highlights. I would add to his initial list other preaching topics like family, marriage, work, and other sermon series that fill up our Sundays in churches around the nation. Goldsworthy rightly points out that while those areas are related to the gospel they are not the essential gospel message, which is God doing for us in Christ what we could not do for ourselves. This doesn’t mean we shouldn’t preach on topics such as I or Goldsworthy have mentioned. Indeed, we should, but in a way that shows the gospel as central and not merely peripheral to those areas. Forgetting this may produce very moral, practical or religious sermons, but not uniquely Christian sermons. On the contrary, just because a preacher uses the Bible to support whatever topic he likes, if he consistently preaches those texts in a way that leaves the congregation thinking there is no need for the justifying work of the Cross in order for them to “make it happen” or “apply the truths” of the message, then that preaching most likely isn’t only sub-Christian but anti-Christian. 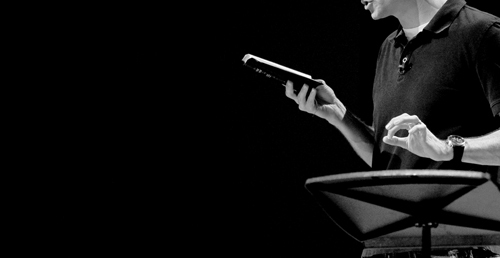 How does your use of the sermon text relate to the larger story of salvation history? Which will your congregation think after hearing your sermon: “Me, myself, and I” or “What a wonderful Savior is Jesus”? Who are you portraying as the hero of the biblical text and your sermon? Why did Jesus need to die for what you’re going to preach this Sunday?